Rose Wilder Lane was the daughter of Laura Ingalls Wilder of Little House on the Prairie fame. She was also a widely published journalist and author, who traveled from humble "Little House" beginnings to destinations around the world that her pioneering ancestors could never have imagined. 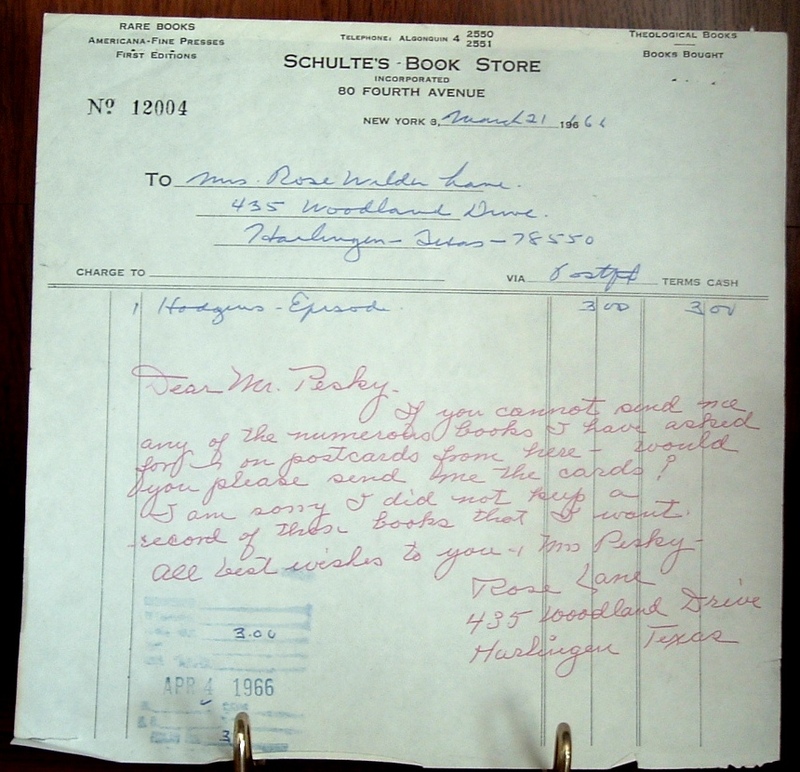 Mr. Pesky was a bookseller with Schulte's Book Store on Fourth Avenue in New York. 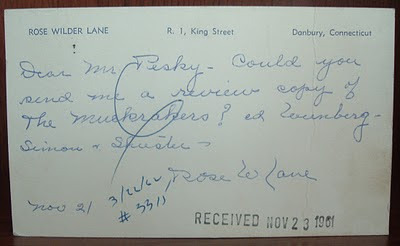 During the 1960s, the last years of their lives, Mrs. Lane bought an interesting variety of books from Mr. Pesky and developed a friendship with her bookseller and his wife. 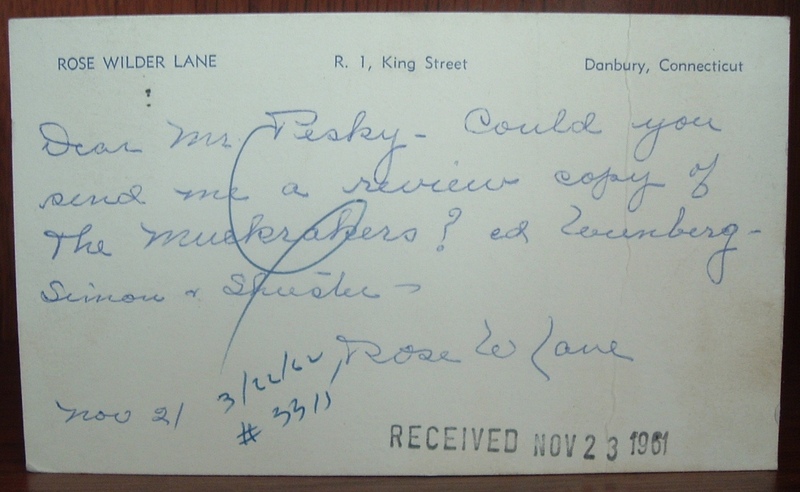 I have a small sampling of their correspondence during these years that sheds light on Rose's reading interests as well as her relationship with the bookseller, Mr. Pesky. Columbia University has in its archives the records for Schulte's Book Store for the years 1918 to 1959. From the brief biography at the archives' site, I learned that Theodore E. Schulte started the business in 1917. 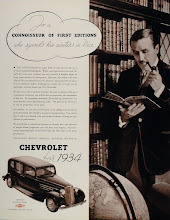 Store manager, Philip Pesky, assumed ownership when Schulte died in 1950. When Pesky died a short five years later, the book store passed into his son's hands. This younger Pesky is the one whom Rose Wilder Lane addressed in the correspondence featured here from 1961 to 1968. We learn from this correspondence that he died in 1967. 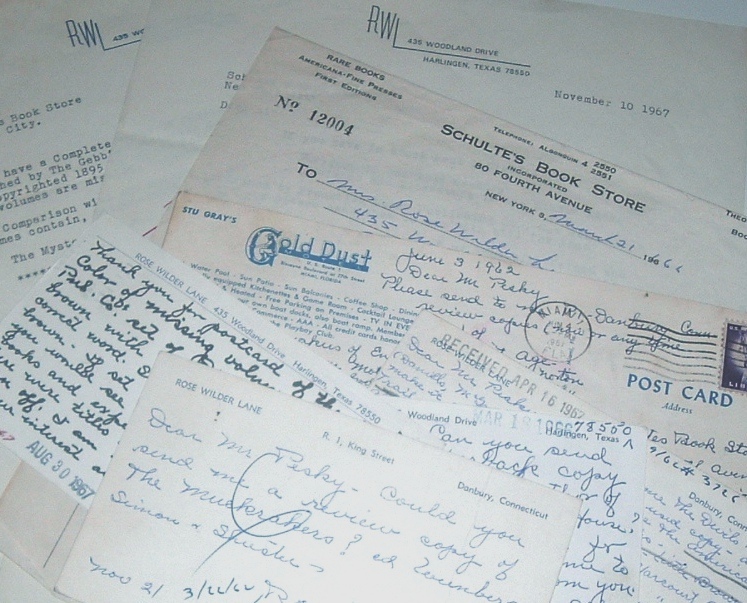 I've acquired a batch of correspondence between Schulte's Book Store and various customers--mostly writers--from the early part of the twentieth century to mid-century and a bit beyond. All will be featured here in a series of posts. 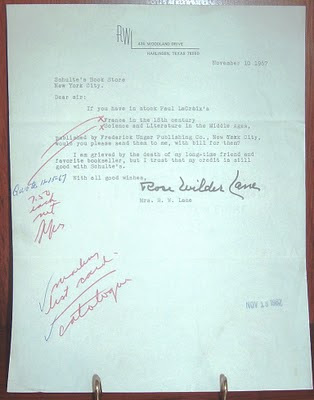 First up, though, are the postcards and letters that Rose Wilder Lane wrote to the man she described as her favorite bookseller. 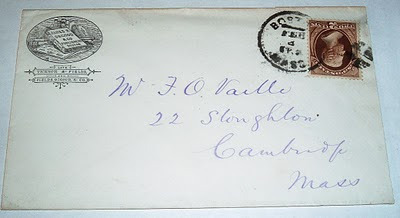 The correspondence in this batch begins in 1961 with a personal post card from Danbury, Connecticut requesting a review copy of The Muckrakers: The Era in Journalism That Moved America to Reform - the Most Significant Magazine Articles of 1902-1912, edited by Arthur and Lila Weinberg and published in 1961 by Simon and Schuster. She appears to have been interested in a look back at a time when she started her own writing career around 1910. A year later, another post card contains requests for various American and British books, as well as a standing order for review copies, as they came in, for the American Trail series. 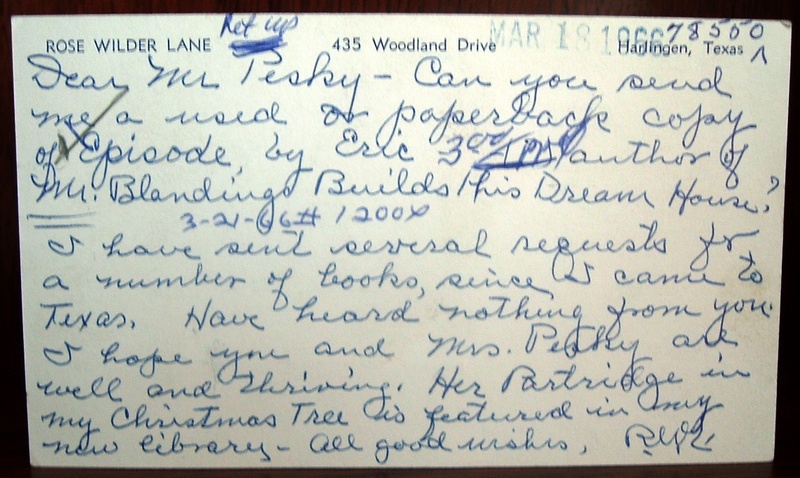 Later the same year, 1962, she has a much longer list of books for Mr. Pesky to fill and send to Danbury, as she writes from Miami. A new personal post card emerges in 1966 with Harlingen, Texas printed as the return address. This cards reveals a closer relationship with her bookseller, Mr. Pesky, as she gently chastises him for not sending her anything since she moved to Texas. She quickly adds that she hopes he and Mrs. Pesky are okay. She then acknowledges a Christmas present from Mrs. Pesky and states that it has a place in her new library in Harlingen. This indicates enough of a friendship to exchange Christmas gifts and a relationship not evident in previous correspondence. 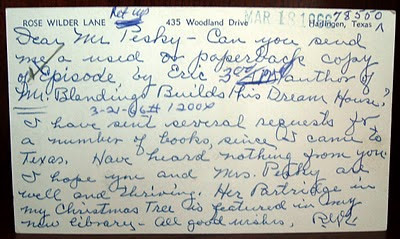 A month later, Rose uses a recent Schulte's Book Store billhead, with one book listed, to write a note back to Mr. Pesky. She seems irritated by the fact that she has not received any of the numerous books she previously requested on her post cards. She either ran out of post cards with the Harlingen address, or she wanted to emphasize with the billhead that she had only received one book all year from Schulte's. At any rate, she wrote in red ink and requested her cards back, as she had not made a copy of all the books she wanted. Rose was quite a reader and impatient for new books to arrive. In August of 1967, Rose's reading attention, or perhaps collector's attention, turns to Dickens. She had a 16-volume set published by Gebbie in Philadelphia, 1895. She was missing five volumes and indicated them in the letter. Later in a post card that month, she gives a more detailed description at the request of Mr. Pesky, who is is obviously having trouble finding exactly what she needs. The last piece of correspondence I have is a typed letter from Rose to Schulte's, on Rose's letterhead, asking for two titles by Paul Lacroix. Her reading desires have now tuned to France in the 18th century as well as science and literature in the Middle Ages. But the big news we learn in this letter is that Mr. Pesky has died. Seems like this would be the opening paragraph, but she put her order in first, then addressed the death of Mr. Pesky, stating that she is "grieved by the death of my long-time friend and favorite bookseller." In the same sentence, she returns to business with "I trust that my credit is still good with Schulte's." It seems like an odd mix of business and grief, but it might appear that she held Mr. Pesky in high regard and her books just a bit higher. 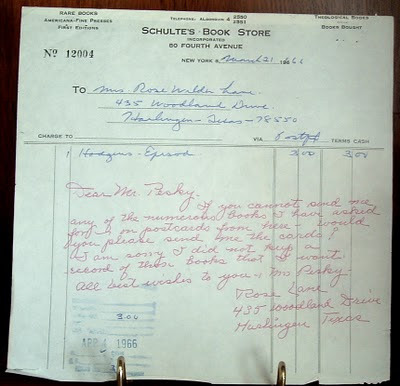 I don't know if she continued as a customer with Schulte's or if her credit continued with them, but Rose did not have much longer for collecting and reading books or buying them from anyone. She died the following year in 1968. Rose Wilder Lane was a remarkable woman who appeared in her mother's Little House series, traveled around the world as a journalist during World War I and later for the Red Cross, and sympathized with Communism until she was discouraged by what she saw in the newly formed Soviet Union. She became friends with President Herbert Hoover. During World War II, she avoided rationing by growing her own food. To avoid paying social security taxes, which she didn't believe in (the whole system seemed a ponzi scheme to her), she quit her job with the National Economic Council. She wrote and authored numerous articles, stories, and books. At the age of 78 she went to South Vietnam as a war correspondent! As for her mother's books, there is speculation that Rose's editing and help was significant enough to have been named as a co-author of the Little House books. 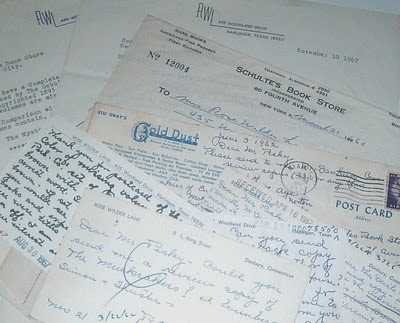 While this small batch of correspondence does not stand up against that of another writer and bookseller chronicled in 84 Charing Cross Road, by Helene Hanff (Lippincott, 1970), it does offer a peek into the tastes and personality of a fascinating woman through her reading and the bookseller whom she befriended and relied upon to provide her with the books she needed. Here is a nice postal cover with letterhead combo from Boston publisher J.R. Osgood. 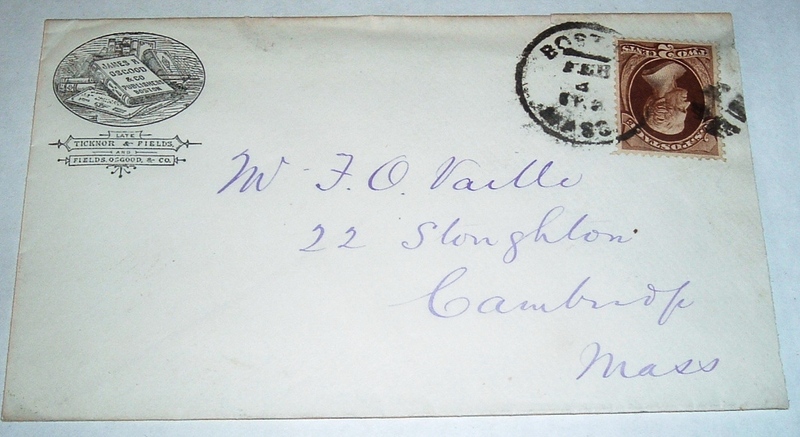 The company's logo and return address graphic, along with the 1875 postmark, provide a bit of company genealogy. The oval image includes a book with J.R. Osgood & Co. printed on it. Beneath that we learn that Osgood either partnered with of succeeded Ticknor & Fields, as the previous name was Fields & Osgood, preceded by Ticknor & Fields. 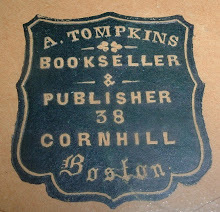 A descendant of the original Ticknor, whose book business started in 1832, took over J.R. Osgood & Co. and returned the Ticknor name to the business. I wrote about this in another post about a Ticknor & Company postal cover. Osgood is writing to a Mr. F.O. Vaille in Cambridge, Massachusetts inquiring about a bond owed him. 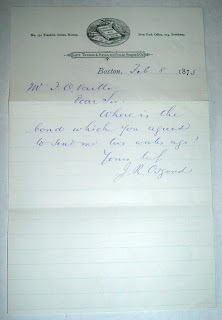 He gets right to the point: "Where is the bond you agreed to send me two weeks ago?" A search for Vaille results mainly in articles related to a book he co-published in 1875 (same year as the letter from Osgood above): The Harvard Book (Welch, Bigelow, and Company, Cambridge, 1875). The two-volume set consisted of historical, biographical, and descriptive sketches illustrated with heliotype plates and wood engravings. Adding to the aesthetics were leather bond and gold embossing. 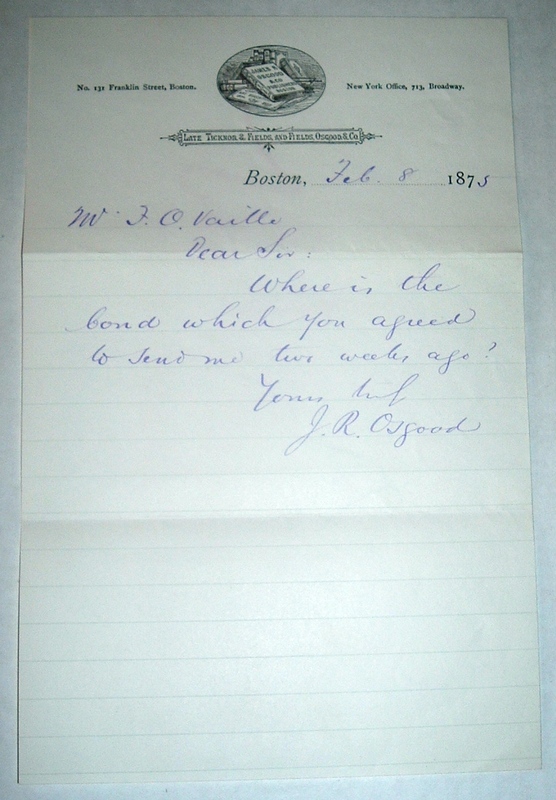 I wonder if Osgood might have been referring to the leather bond when inquiring about where the promised bonds were? And could this be evidence of Osgood's involvement initially with publishing The Harvard Book? Perhaps Osgood started out as publisher, but conflicts arose between author and publisher and the job went to Welch, Bigelow, and Company. Both the book and its author have fallen into obscurity. 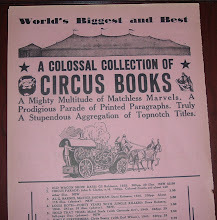 Osgood's books still pop up in old book shops and vintage ephemera related to the publisher surfaces occasionally. 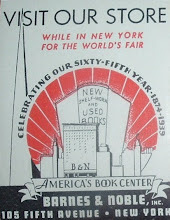 So the ephemera here is primarily significant for the history it conveys about a major publishing house in 19th century Boston in its evolution to the company today known as Houghton Mifflin. Any perceived mystery is for fun. In researching J.R. Osgood, I found a legitimately fun item of literary history involving his role in an interesting piece of Dickensiana. In 1868, Osgood was a junior partner with Ticknor & Fields, Charles Dickens' American publisher. Dickens was in Boston to collect information about a murder case, the facts of which tied into a new novel he was undertaking at the time: The Mystery of Edwin Drood. Two years later, Dickens would be dead and the novel unfinished. While Dickens was in Boston, his reading tour manager, George Dolby, and Osgood somehow got involved in a walking race. 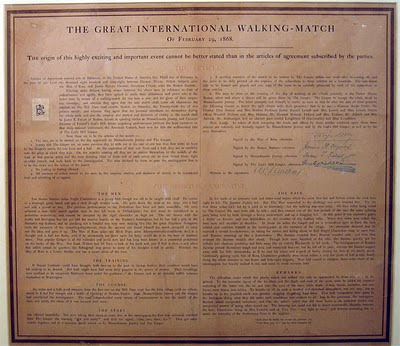 Perhaps Dickens, an avid walker himself, originated the idea. 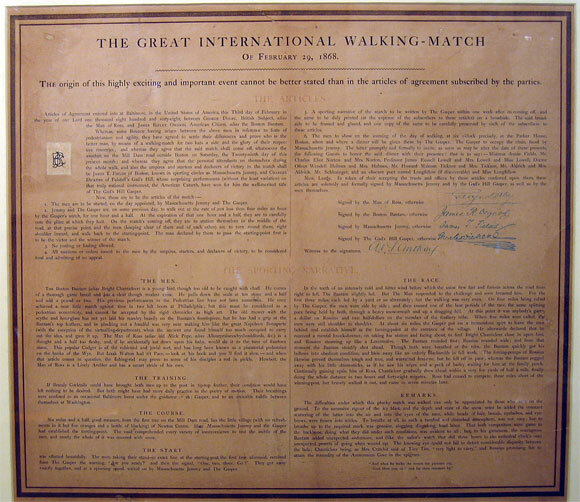 What is certain, though, is that Dickens authored a folio size broadside about the race: The Great International Walking Match of Feb. 29, 1868. According to Charles E. Goodspeed in Yankee Bookseller (Houghton Mifflin, 1937), only a few copies of the broadside were printed for guests at a dinner hosted by Dickens to celebrate the event. Goodspeed's book is where I initially learned of Osgood's involvement with Dickens and the race. The Charles Dickens Museum provided more information as well as an image of the rare broadside, shown below.